The Blooper Diver is a kart from Mario Kart Arcade GP DX. 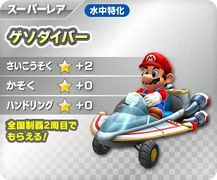 The kart is designed to be shaped like a Blooper, with the mufflers resembling a Blooper's tentacles. The Blooper Diver's Type S alternate color is black with yellow stripes; Type X's color is light gray with cyan stripes. This page was last edited on May 10, 2018, at 00:00.